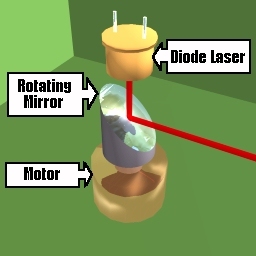 To add vertical scanning to the 360 degree horizontal scanning, rock the laser diode (used here as a light detector rather than emitter) back and forth while always pointing it directly at the same place on the mirror. This rocking motion can be easily (and cheaply) implemented with a worm gearn driven large plastic cam to lever actuator attached to the other side of the motor's drive shaft. To avoid breaking the 360 degree view of the system, mount the sensor on a rocker attached to a clear plastic "bubble" covering the bottom of the system. Use a reflective strip on the sensor mount or a mechanical wiper on the worm gear end to provide an indexing pulse. The system microcontroller will wait a specified period of time before capturing signals from the sensor on each revolution in order to select a portion of the total visable area. This data will be forwarded to the host system via a high speed infrared link.